Happy Mother's Day, mom! Thanks for all you are, all you've done and all you continue to do! It was my mother who introduced me to Jesus Christ as a 6-year-old boy. 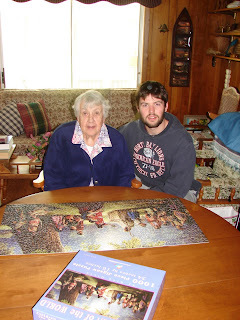 Then it was my mom (and dad) who nurtured that new-found faith through my childhood and teenage years. This morning it was my privilege to worship with mom at our home church, Auburn Bible Chapel. She is a godly woman, a prayer warrior and a friend to many. P. S. Here's picture of mom with David Shantz, former goaltender with the Peterborough Petes and presently playing for the Florida Everblades. One aspect of mom's ministry was making incredibly tasty ginger cookies for David.